Cuba is bigger than you might think. You’ll likely use all three months of your visa if you ride the whole island. And I recommend you do because Cuba is like no other country in Latin America – or the world for that matter. But the Cuba you’ll experience as a bicycle traveller isn’t the Cuba most visitors see. Contrary to popular belief, Cuba is not a place of loud street parties, musicians on every corner, and noisy political rallies. Cuba is mostly a quiet place, even in the towns. That splashy, in-your-face Cuba of tourist and news propaganda represents a very limited view. You’ll spend most of your days pedalling to the sounds of sugar cane shuffling in the wind, or waves breaking on a pebbly beach, or the occasional whistle of a campesino communicating with beasts of burden in a nearby field. In the towns, the noisiest feature is usually children in schoolyards playing and screaming (recess seems to be an all-day event in Cuba). Often, I’d arrive in towns where everyone seemed to be simply sitting around, not working, not really doing anything; at most, there might be a domino game going on in the park. Another common misconception is that Cuba is expensive. 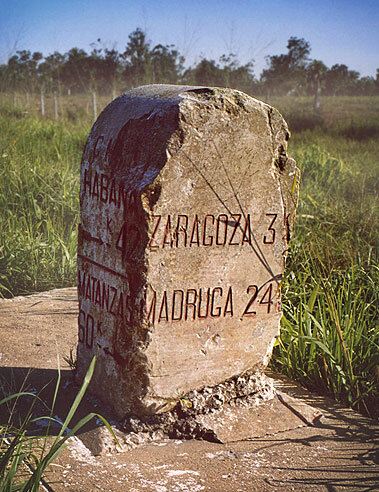 Around the holiday resorts in Varadero and at tourist sites in Havana, Viñales, and elsewhere, this may be true. But out in the real Cuba, the Cuba where most Cubans live (and where you’ll be cycling), it’s easily the least expensive country to bike tour in Latin America. Cuba uses two currencies, the Convertible Peso (CUC, also called divisa, and used mostly by tourists) and the Cuban Peso (CUP, also called moneda nacional, and used mostly by Cubans); you’ll be using the latter, not that you’ll have much to spend your money on. 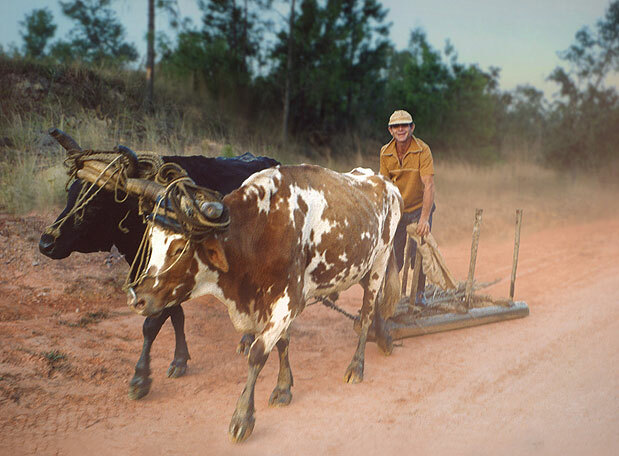 Bueyes (oxen) pulling a sled: a common sight in rural Cuba. Even when you do find a little bakery or somewhere to buy staple foods, you’ll be told that, as a foreigner, you cannot purchase anything and that everything is “bought” with ration booklets (or por cuota, as they say in Cuba). But as they also say in Cuba, “en Cuba se resuelve todo” (in Cuba there’s always a way), and if you’re patient, it’s fairly easy to bribe the worker behind the counter to “sell” you some food for a few CUPs when nobody’s looking. If you’re a shy person who always follows the rules, you’ll find Cuba a difficult place to tour. In rural Cuba you’ll have to knock on doors to find food if you don’t want to starve. Any private house in the campo is a potential restaurant. Simply knock on the door, explain that you’re travelling by bicycle, and that you’d like to buy some food. The occupants won’t think this is strange; they understand the system and why you’re hungry. I did this all over the country and I always ate my fill for under five dollars. You’ll often be invited to sit down with the family for a cooked meal (usually rice and beans, perhaps with tomatoes, eggs, or pork). It’s also a great way to meet people and learn about the local area. Cuba has a kind of institutionalized bed-and-breakfast system whereby rooms in certain private homes (casas particulares) have been turned into guest rooms (look for the green or blue arrendador inscripto sign on the door). I have a couple of thoughts on this. First, not all casas are for tourists; some are for Cubans only (red sign). Second, there are two kinds of casas: the official, government-endorsed casas where you’ll have to surrender your passport and follow the rules; and the unofficial, illegal, easy-going casas which are just as good but do not advertise themselves (for obvious reasons). Guess which are cheaper. 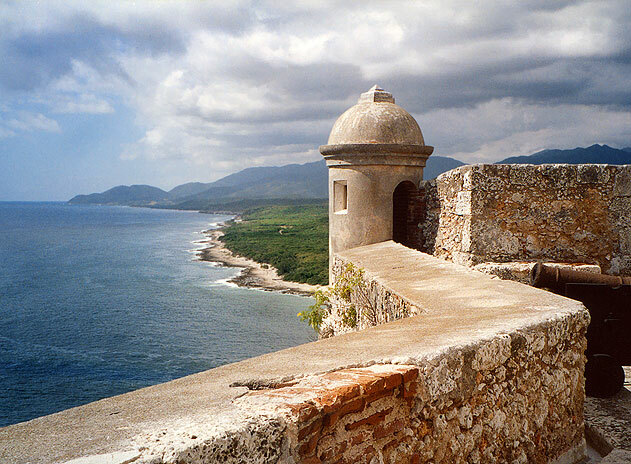 Castillo del Morro, Santiago de Cuba. Sierra Maestra mountains in the background. 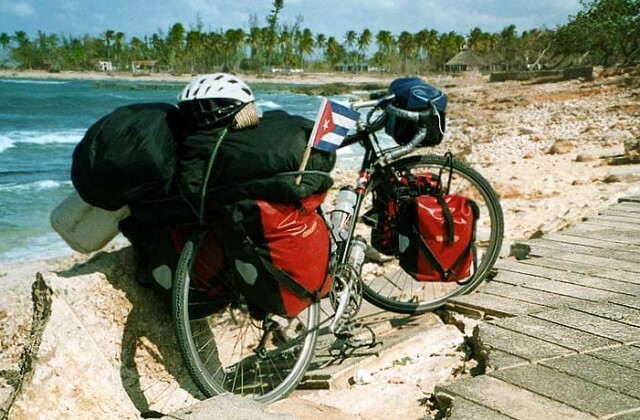 The best accommodation for cyclists in Cuba is camping – the whole country is like one big camp ground. I’ve camped in forests, next to rivers, in farmer’s fields, on deserted beaches, in mango plantations, grapefruit and orange groves, and behind people’s houses. It’s free, it’s fun, and there’s always somewhere to pitch a tent. But be sure to study the ground before you peg down because the ants are a bit of a nuisance in some areas. The hills can be very steep in Cuba and the headwinds very strong in some areas. Traffic is not an issue for cyclists as there are relatively few vehicles on the road. Cyclists will experience more freedom in Cuba than any other type of traveller. Cuba is a rewarding country to cycle; often beautiful, sometimes frustrating, always interesting – an unforgettable place that will change the way you think of Latin America and Latin Americans. Evasive Cycling Maneuvers In Cuba How to dodge a Cuban toll gate with out getting caught! Bike Shops: What’s Not At The Bicicletería When you land in Cuba with a smashed derailleur, how do you find a replacement in a country with no stuff? Sometimes, You Gotta Push Cuba’s Sierra del Escambray has some of the steepest hills in Latin America. 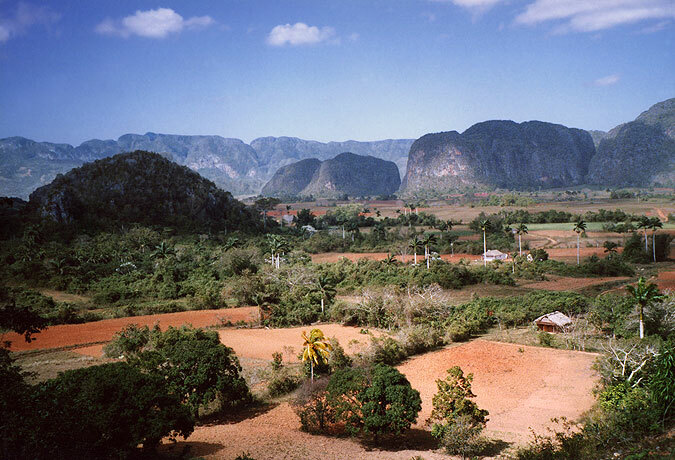 Viñales valley in Pinar del Río province. Feature image (top of page): A hurricane-damaged coast in the north.